Radiation damage occurs in reactor pressure vessel components, causing microstructural changes that leave reactor pressure vessel steels in an embrittled state and/or susceptible to stress corrosion cracking. This is a crucial concern since nuclear plants throughout the US are entering a period of life extension, so reactor pressure vessels will be exposed to higher levels of neutron radiation than they were originally designed to withstand. The development of a nondestructive evaluation technique to characterize radiation damage would enable the assessment of the integrity of the vessel, allowing operators to determine if reactors can continue to operate safely. In this talk, I will demonstrate how nonlinear ultrasound (NLU) can be used as a nondestructive evaluation tool to monitor radiation-induced damage in nuclear reactor steel components. NLU is a nondestructive evaluation technique that is sensitive to microstructural features in metallic materials. The physical effect monitored by NLU is the generation of higher harmonic frequencies in an initially monochromatic ultrasonic wave, arising from the interaction of the ultrasonic wave with microstructural features. Recent research has demonstrated that NLU is sensitive to the same microstructural changes that are produced throughout radiation damage, such as precipitate formation and changes in dislocation density. This talk will discuss applications of nonlinear ultrasound to both radiation embrittlement and stress corrosion cracking. 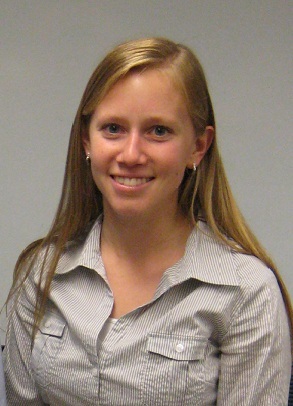 Katie Matlack is a Ph.D. candidate in the Woodruff School of Mechanical Engineering at Georgia Institute of Technology. She received a Bachelor of Science in Mechanical Engineering, with a minor in music, from Massachusetts Institute of Technology in 2008. She is currently working with Dr. Laurence Jacobs and Dr. Jianmin Qu (Northwestern University) to utilize nonlinear ultrasonic techniques to characterize microstructural changes in metallic materials. In 2010, she was awarded a National Science Foundation Graduate Research Fellowship. Her research presentations have won awards in student poster competitions at the Review of Progress in Quantitative Nondestructive Evaluation conferences in 2010 and 2012. She has been an invited speaker at multiple Department of Energy-sponsored workshops on nondestructive evaluation of nuclear reactor components, and was recently invited to present her research at the Rising Stars in Nuclear Science and Engineering Symposium at MIT.